MSRP $199 – Free Shipping! 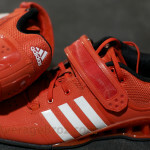 The 2012 Adidas Adipower is Adidas’ newest flagship Weightlifting shoe. It replaces the 2008 Adistar and marks the end of an era. This model is a drastic change for Adidas. This shoe first started to appear mid-2011 at trade shows. It donned black accents with a striking reddish-orange main color and looked amazing. The production model is very stark in comparison, due to the missing black accents. It appears incomplete after seeing the prototype. It’s colored in a low sheen flame red, with the only contrast being the three white stripes. The overall lack of detail, dunked paint-bucket appearance, and plastic look makes this new model look more generic than every predecessor which resembled a finely manicured Italian shoe. Now it appears Adidas pressed the shoes out of a block of plastic then rolled the bottom with a very thin layer of black rubber. The biggest deviation from former models is the elimination of the wood heel in lieu of a composite material (TPU–thermoplastic polyurethane) very similar to the Nike Romaleos 2. This marks the end of an era. The wood heel was a real trademark for lifting shoes. The sound of your heels hitting the wood platform made a nice crack, like a well-hit ball off a wood bat. The TPU heel just won’t make the same noise. This decision certainly lowers manufacturing costs versus real, hand polished wood heels of past models. 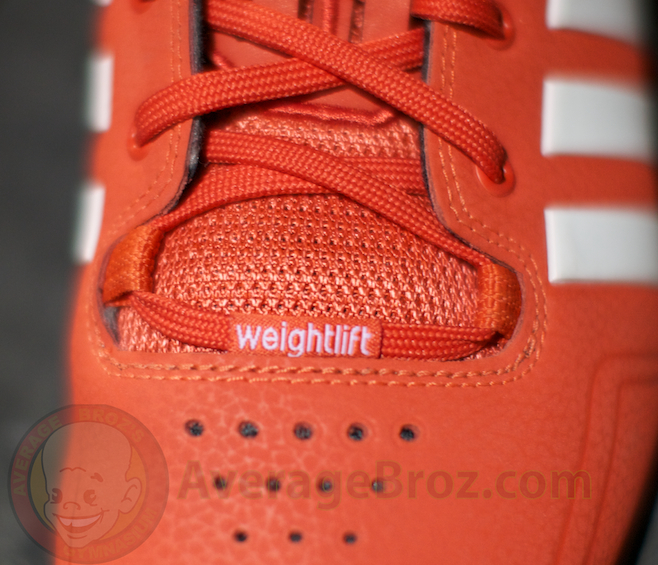 Heel height is one of the major reasons why people buy Weightlifting shoes, so that they can take advantage of improved body positions and lift more weight. The pitch of the shoe is far more important than only measuring the heel. If the forefoot of the shoe is thicker, then the effective pitch is less and nullifies heel height. This is why we measure both heel and forefoot and calculate the overall pitch. On the Adipower, the switch from wood to TMU made the heel and shoe height less, but the pitch remains consistent with past models at 7.8%. The overall functionality with the new heel is excellent, and the forefoot of the shoe is remarkably pliable. It’s the best of both worlds — a super stable heel with a very flexible toe. Adidas’ own technical callouts specifically mention “flexible forefoot” and “secure heel fit.” Different than previous models, the Adipowers provide superb ventilation that will keep your feet comfortable and dry, even during all day training sessions. 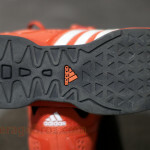 Adidas included center channel vents that can be cut out of the outsole to create vent flow openings on the mid foot and forefoot, which could not be done in the past due to the wood heel. The addition of an arch support offers another positive change from past models. 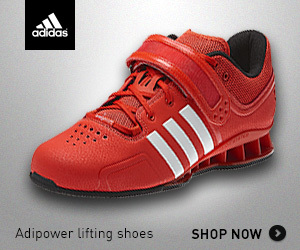 Adidas Weightlifting shoes notoriously had minimal to no arch support built into the shoe. Instead, Adidas incorporated them into the insole. The Adipower has more of a pronounced arch built directly into the shoe, code-named “mid foot torsion system.” The upper is leather, which keeps with tradition. Its ultra-light weight will be a huge surprise to rival shoe owners. 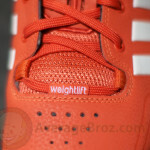 Size 9 tips the scale at only 458g, which is extremely light and only bested by the Reebok CrossFit Lifter. 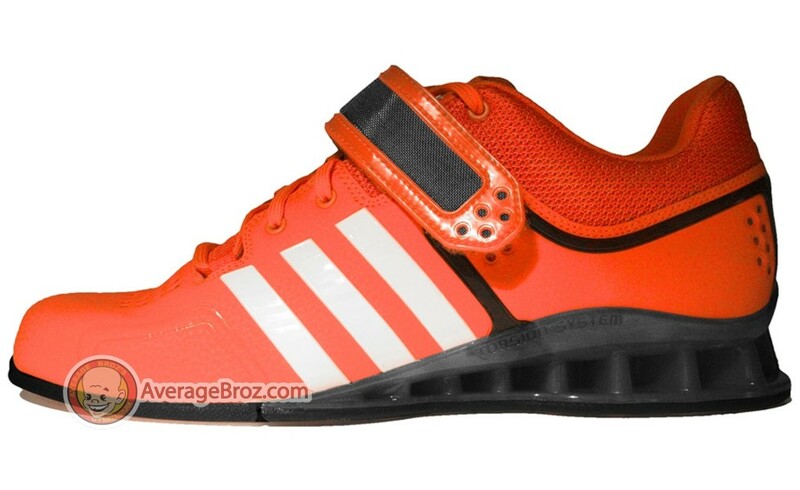 All shoes come standard in D width, which will accommodate most lifters. We have used the shoes, and those with normal width feet, after 1 week of use, reported the shoes broke in nicely. Lifters who had extremely wide feet took an extra week. To test quality control, we weighed the left and right shoes individually and found, on average, a 1.6% difference in weight. With every new version Adidas always makes a change to the strap. 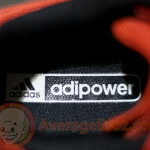 They have experimented with single buckle, three straps, cross overs, Velcro, clips, etc., and the Adipower is no exception. On this version, the single Velcro strap is a bit wider than its predecessor. Not a big change, but the tricky part about this new strap is the location: it’s attached to the shoe closer to the opening than in previous models. The new plastic strap is more rigid than leather and stays directly over the point where you tie the shoe. This positioning turns the strap into an obstacle that won’t hang loosely out of the way like on previous models. When putting them on you have to tighten the laces, fasten the strap, then tie the shoe. If not, the strap keeps getting in the way when attempting to tie the laces. This is a bit of a hassle, but when you are finally done, it’s worth it. My first impression was that the shoes felt amazing. They fit like a glove. I could immediately feel its lighter weight and flexibility. Lateral support is slightly improved over the 2008 model. The tongue inside is extremely textured with a directional neoprene material that feels like it’s holding your foot firmly in place. 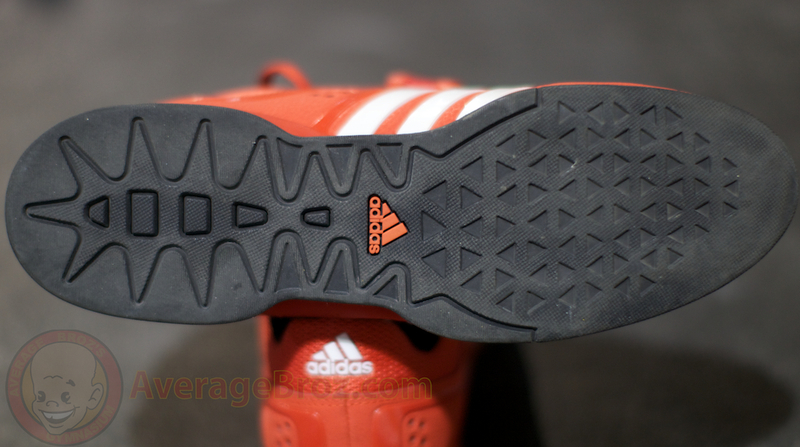 Unlike the previous Adistar, which ran ½-1 size long, these are true to size. For women, Adidas recommends ordering 1.5 sizes smaller. From our experience, we have noticed that 1 size is sufficient. In training, I started with Clean and Jerks. I noticed that you feel more secure in the bottom position in the Clean and more stable in the Jerk. After investigating, we realized that the overall base / contact patch of the shoe is about 15% greater than the ’08 model, but the extra stability was from the edges of the sole around the shoe. The perimeter extends further, especially behind the heel. The ’08 model’s base is almost even with the back of the heel cup, but the new model extends back almost 1/2″! This difference is noticed immediately, another advantage of TMU construction. This will help your balance immensely if a Clean gets you too far back on your heels. The sole underneath the arch touches the ground as well. This additional surface area, combined with the width of the base, gives the lifter a more confident feel in the lifts. When wearing them around the gym, after about 4 hours your feet begin to feel tired from the lack of absorption that a sneaker offers, but for normal training sessions, there was no issue wearing them without discomfort. The flexibility makes it easy to walk around in. You almost forget that you have lifting shoes on. Overall, we all truly enjoy the shoe. 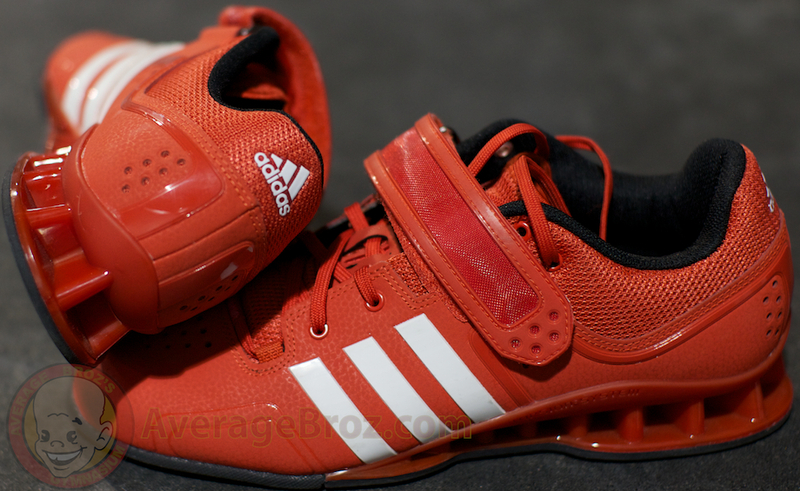 Ignoring the color and judging by comfort and performance, the 2012 Adidas Adipower is the best Weightlifting shoe on the market today. Hello, I’m looking for the adipowers with the black heel and black strap, what website can I find them for sale? 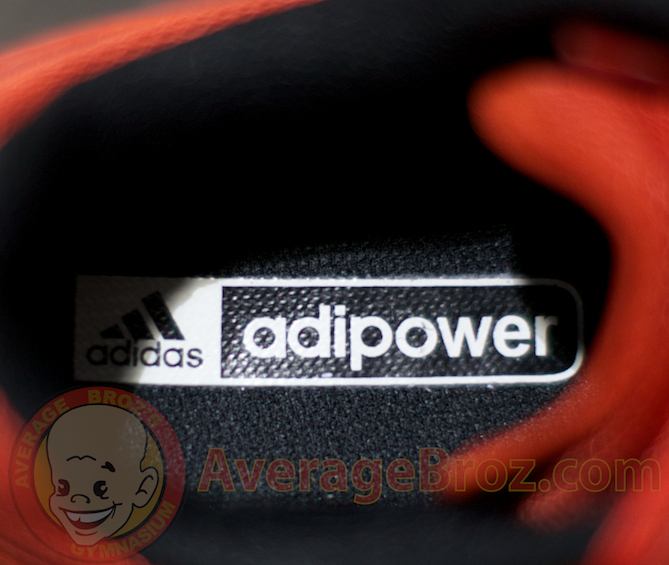 Check the newest review on the 2014 Adipower. There is a link to purchase.